Two appearances – the school in The Fireman and Sherlock Jr. 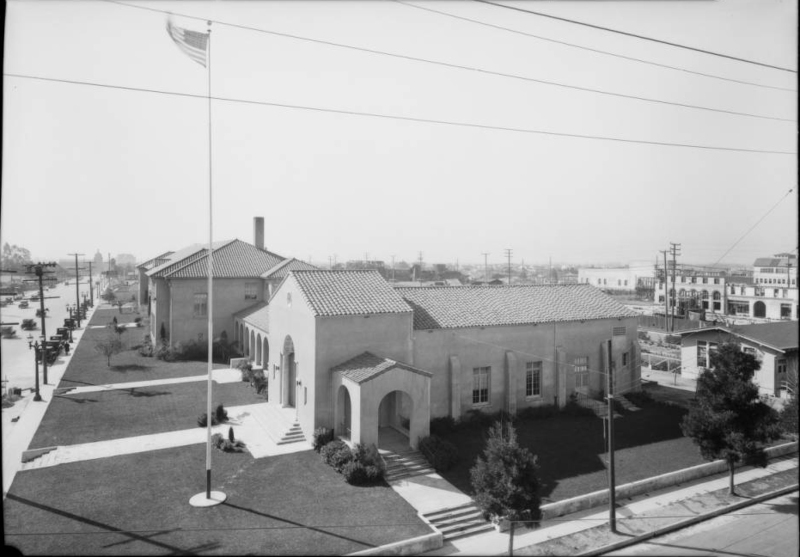 Rebuilt over the years, but pre-dating 1912, the Vine Street (Colgrove) Elementary School still stands between Romaine and Willoughby, kitty-corner from the site of the former Keaton Studio block in Hollywood. The back of the school, with its distinctive series of chimneys, appears during scenes filmed looking south down Lillian Way both in Charlie Chaplin’s The Fireman (1916) and in Buster Keaton’s Sherlock Jr. (1924). 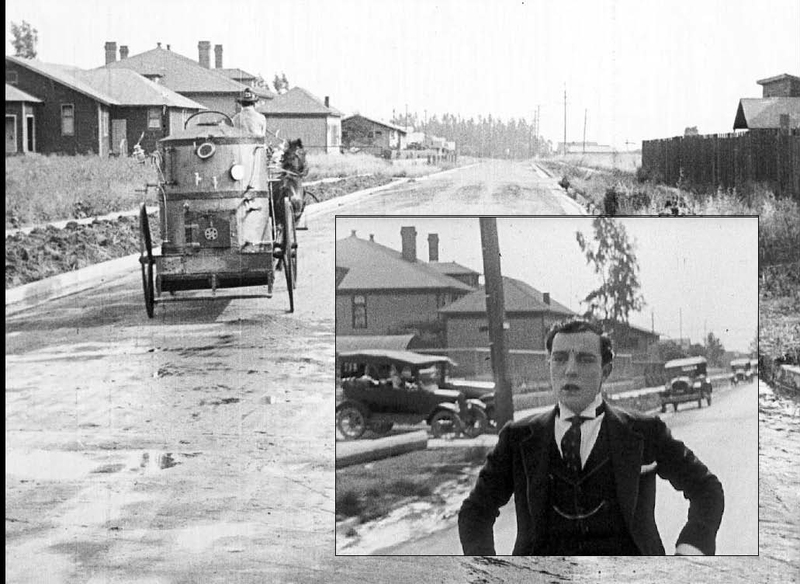 The school also appears (far left, below) during Buster’s race to the rescue in College (1926), as he turns north from Lillian Way onto west along Romaine, fleeing past the abandoned Metro Studio offices standing across the street from his studio. The current school campus was built in 1922, 1926, and re-built in 1936. Reportedly Mrs. Eleanor Keaton attended kindergarten here at the time Buster was filming Sherlock Jr. 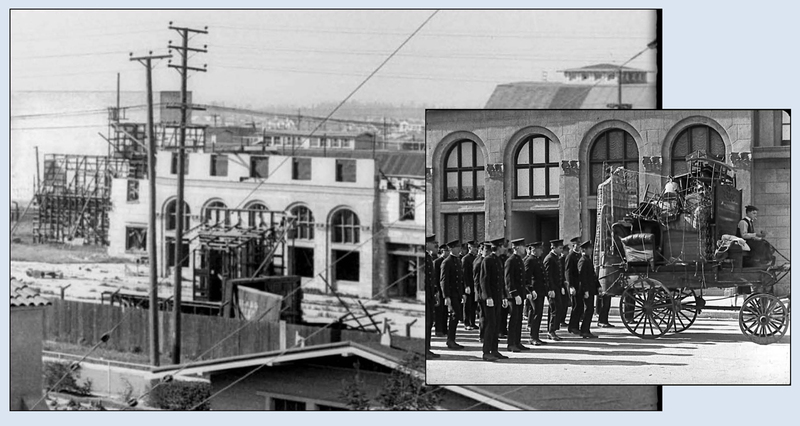 Remarkably, the far right background of this 1928 photo of the school (above) provides a sneak peek over the Metro Studio fence (due south of the Keaton Studio), to reveal a conspicuous 5-arch backlot set appearing in Cops (1922), Three Ages (1923), and Go West (1925). 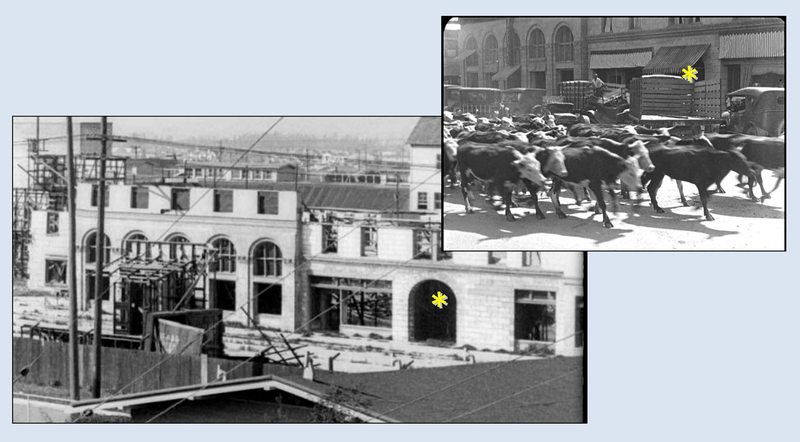 Although the Hollywood Metro Studio closed in 1924 to join M-G-M in Culver City, Keaton continued to make use of the abandoned studio’s backlot, particularly when filming the many cattle stampede scenes from Go West. The five arch Metro backlot set as it appears in Cops. The Rector Cafe nightclub from Three Ages. A full view of the 5-arch set and neighboring central arch set (*) appearing with Buster’s cattle in Go West. I’ve always been fascinated imagining what it would have been like to wander around Buster Keaton’s studio. 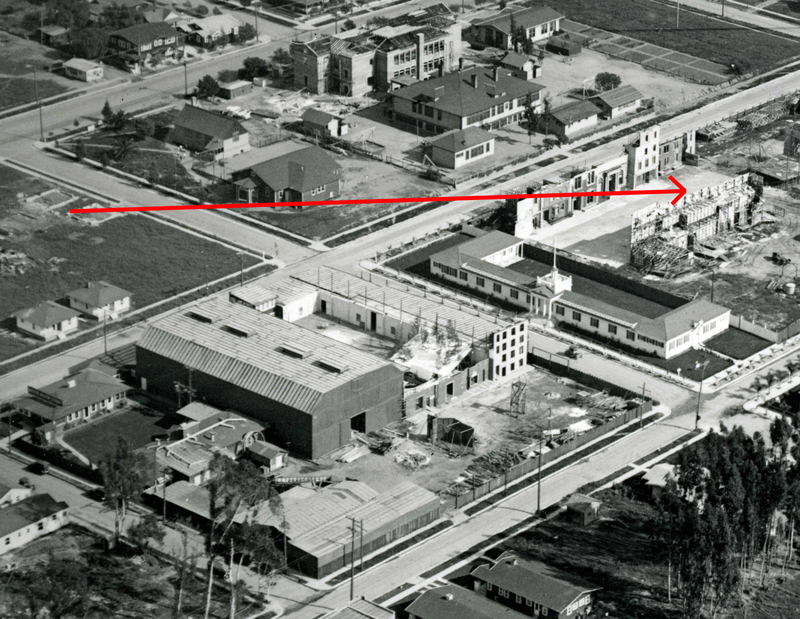 I’ve written several posts analyzing vintage aerial photos of the studio, taken in 1921 and 1922, available from HollywoodPhotographs.com. 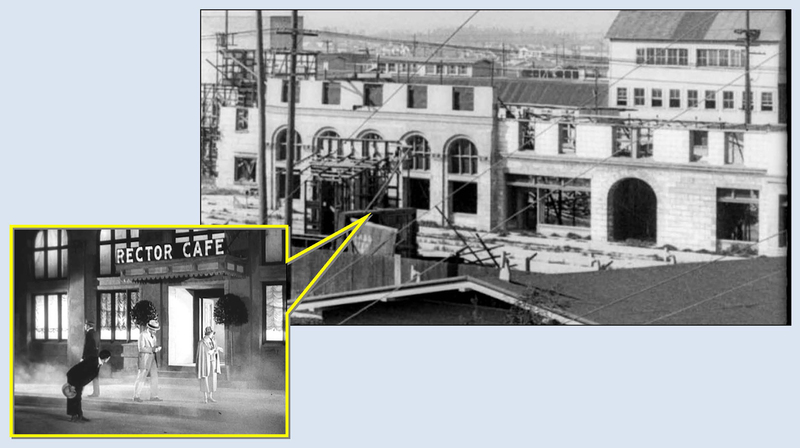 But as shown here, you’ll never know where other images of the studio might pop up, even over an old school fence. The Romaine Street view of the school. This entry was posted in Buster Keaton, Cops, Keaton Studio and tagged Buster Keaton, Charlie Chaplin, Cops, Keaton Locations, Keaton Studio, Silent Comedians, Silent Comedies, Silent Movie Locations, then and now. Bookmark the permalink. Your findings never fail to amaze me. So neat to see a peek of that backlot set! Thanks Nicole – it was a fun surprise to notice this in the background. You may or may not remember me from emails we exchanged back in April of 2015, after I made a visit to the Cottage Grove and Culp Creek film locations. On an unrelated note: in your travels and meetings with other Buster researchers and fans, have you perhaps come across any indication of where I might find more particular information (beyond that outlined in the film itself) relating to Buster’s route and stops while making “The Railrodder” back in 1965, for our National Film Board? Obviously much later than the era and films on which you are focused, but it’s of considerable interest to me – – and to many other Canadians who grew up in the sixties and seventies. In particular, “The Railrodder”, and the simultaneously made documentary “Buster Keaton Rides Again”, used to be standard viewing in many Canadian schools, as a fun way to get Canadian kids interested in more distant parts of the country. It was also a fascinating introduction to Buster (and Eleanor! ), with anecdotes about the old days, and intermittent fascinating demonstrations about his approach to film-making – – including his wonderful ability to improvise and create/refine routines. In any event, thanks again for the ongoing posts.